The Perception Pescador 10 is a versatile kayak in the true sense of the word. Not only is it great for fishing adventures, but you will also enjoy it for recreational purposes too. It performs amazingly well, and both beginners and experienced kayakers find it very easy to use. The stability is excellent, and you will get the most out of this kayak when using it on flat and calm water. Thanks to the rod holders, gear tracks, and smart storage solutions, this kayak is ready to take fishing straight away. Additionally, since you’ll be sitting the whole day, Perception has put great effort to make your experience as comfortable as possible. The included seat is padded and adjustable, and you also get sliding footrests that allow you to find the optimal position. There’s one more hidden benefit to this kayak – ease of transportation. Thanks to the fact that it’s shorter than most of its competition, you won’t have any problems taking it with you. On top of everything we mentioned, the low price tag makes it available to everyone. 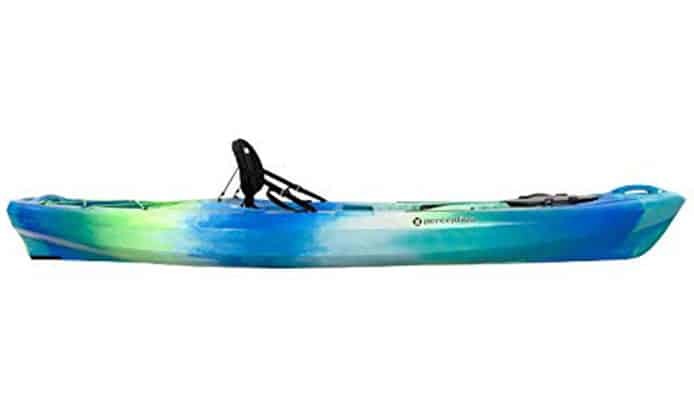 If you want to learn more about the advantages of buying this kayak, make sure you read through the rest of this review. 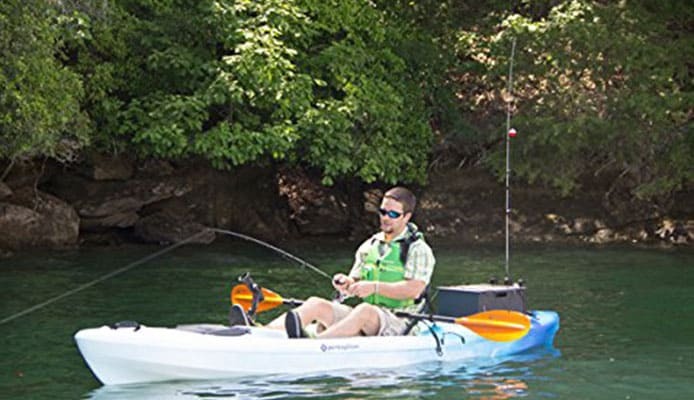 The abundance of smart features is what makes this fishing kayak so attractive. The manufacturer managed to find the right balance, so it comes with everything you need, but at the same time isn’t overloaded with unnecessary stuff that would increase the weight. You will get rod holders, gear tracks and a high level of compatibility with various fishing gear from other manufacturers. All this is paired with significant comfort of course. Take a look at the features that make this kayak an excellent choice, especially in this price range. 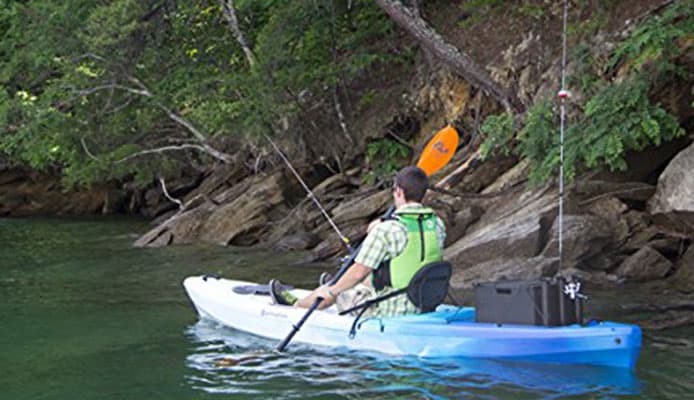 Usability: Paddlers agree that the Pescador kayak is really functional. It’s well adapted to anglers and very easy to maneuver and control. Because of the design, it will perform best if you use it in calm or slow-moving water. On the other hand, you will have problems if you encounter stronger winds and waves. Like other fishing kayaks, this one isn’t particularly fast. However, it’s incredibly stable and tracks really well, according to most users. Because of the lack of speed, you won’t be able to cover large distances without being tired (but this kayak isn’t made for this anyway). If you want to go on long trips and cover large distances, you should consider a touring kayak instead. Stability: Thanks to the hull design, this kayak is really difficult to flip. This is certainly a big plus in terms of kayak safety. It’s very buoyant too, and you shouldn’t expect any problems when getting in and out of the kayak. However, we would advise against standing up while inside because it can become tippy and cause you to lose balance. If you think you need to stand when casting the bait, you should consider equipping the boat with some kayak stabilizers. Since we’re on the subject on safety, always remember to wear a life jacket when going out, no matter how safe you feel. The manufacturer has included six scupper holes on this kayak (four in the cockpit and two in the tankwell). These are used to improve stability by draining the water, but they can also make the performance worse. Even though you don’t get plugs with the purchase, many kayakers have improvised and plugged them to get better performance. Storage: Kayakers are more than satisfied with the storage options this one offers. It also has a good storage capacity so you really don’t have any limitations. In the front area, you get a sealed hatch with hinges, which keeps your valuables dry. The lid on it is tethered so you don’t have to worry about losing it. The stern area has a large tankwell, rigged with bungee cords. It’s deep, wide, and has more than enough room for a milk crate with all your fishing gear. You can also use it to secure a dry bag or a kayak cooler with food and drinks you need for the day. Comfort: This kayak feels nice to be in. The seat is good, with a padded bottom and an adjustable backrest. However, some users say it feels a bit stiff and should be improved. The simplest way is to do this is to get a cushion to sit on. Of course, you can always go out and get a better kayak seat. The footrests are very easy to adjust, as they slide on a rail. This makes it possible even for taller kayakers with long legs to find the most comfortable and stable position. We also like the neat cup holder in front of the seat, which is handy to keep your beverage from spilling. Finally, you get a paddle holder on the left side. It secures your kayak paddle with a bungee cord, and saves you from having to fish it out of the water if it slips. This way you have both hands available to grab the fishing rod, or take out your waterproof camera to snap a photo. Fishing: It’s very easy to fish out of this kayak. You get two nice molded-in rod holders behind the seat, which are very handy. Some users say they are too wide, but this is an easy fix. Both sides of the kayak are equipped with gear tracks, which are basically rails on which you can easily attach additional rod holders or a base for a kayak GPS. The center console is wide and convenient for installing a fish finder for example. As a matter of fact, the Perception Pescador 10 angler is gear-friendly throughout, so you won’t have a difficult task setting up the kayak for fishing however you like it. We would also suggest that you install a kayak anchor too, so you don’t drift too much when the bait is in the water. Portability: A big upside of this kayak is its compact size. You won’t have any problems strapping it down to the roof rack, or even throwing it in the back of your truck. However, it is relatively heavy, to be honest. While some people can carry the kayak on their own, others will need some help. Luckily, the kayak is designed with 4 molded-in carry handles which makes thing much easier. You can also consider getting a kayak cart and simply rolling the kayak down to the water. Price: 95% – This is a great price, especially if you consider the overall quality. We like that you don’t have to ruin your budget, and still be able to get a reliable and long-lasting kayak. Honestly, it’s one of the best kayaks for those who are new and want to get into kayak fishing. Material: 90% – The thick body is made of high-density polyethylene, using the rotomolding process. We appreciate the strength, and also the fact that you don’t need to be too careful once in the water, because it’s very difficult to damage this kayak. Design: 95% – As we mentioned, the design is really smart. They included all the features you need to begin, and made the cockpit spacious and functional. 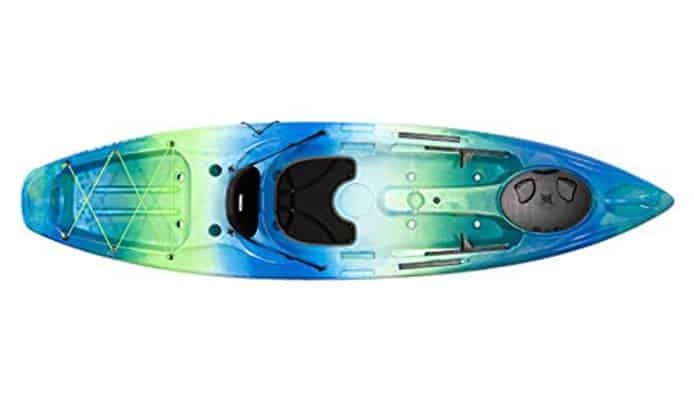 On top of this, the Pescador kayak is a real treat for the eye, and you get to choose among five different color schemes when buying. Overall: 93% – We have a very high opinion of the Pescador 10. It’s a great entry-level fishing kayak that can be used for many different things. However, if you’re a serious angler, you may expect a bit more from your kayak. In that case, be sure to check out the Perception Pescador 12 Pro which is longer and equipped with even more features. The Perception Pescador 10 is ready for whatever you throw its way. It’s incredibly comfortable and easy to handle, allowing anyone to enjoy it. Whether you want to go on a fishing trip or spend a relaxed day cruising the lake with your friends, this one has you covered. This recreational kayak is budget-friendly too, while managing to offer the same level of quality as some more expensive kayaks. If you like the features it comes with then you really don’t have to worry about anything else – it’s an excellent kayak in all aspects. The Perception Pescador 10 is a versatile kayak in the true sense of the word. Not only is it great for fishing adventures, but you will also enjoy it for recreational purposes too.